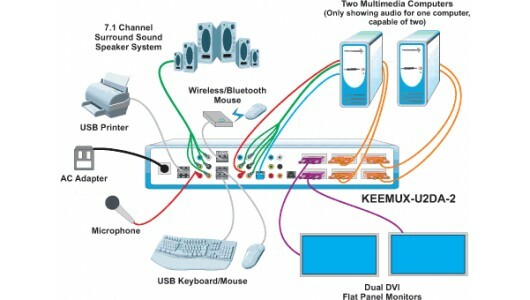 The Dual Monitor DVI USB KVM + 5.1 7.1 Surround Sound Audio Switch allows one user to access two multimedia computers with dual head (DVI+DVI) display connectors with one USB keyboard, USB mouse, two DVI Monitors, and 5.1 7.1 surround sound speakers. 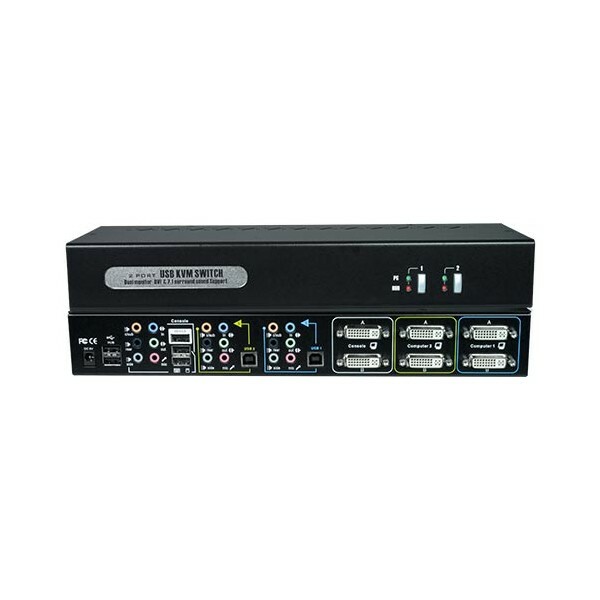 The switch also includes one USB 2.0 device port for full driver support of wireless/Bluetooth keyboard/mouse set and a USB 2.0 two-port hub for connecting scanners, storage devices, web-cams, camcorders, and other multimedia devices without rebooting. Support Dual DVI Monitor/Flat Panel Display. 5.1 7.1 surround sound support for true home theater audio experience. User-configurable simultaneous/ independent switching of audio/hub/computer ports. USB device port for advanced wireless/Bluetoothkeyboard/mouse set. Front-panel push button and hot keys for port selection. Front panel LEDs for easy port status monitoring. 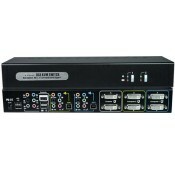 Compatible with USB computers (PC, SUN, MAC) with dual head DVI connectors. Multiplatform support: Windows 98/SE/ME/2000/XP/Vista/7, Mac OS 9/10. Support for DOS, SUN, and Linux without control software.